Mumbai: The value of announced merger and acquisition (M&A) deals involving Indian companies more than doubled to reach $129.4 billion in 2018, according to data compiled by Thomson Reuters. The previous highest was $67.4 billion in 2007. The number of announced deals also grew 17.2% from a year ago. Average M&A deal size for transactions with disclosed values increased to $127.8 million in 2018 compared to $82.8 million in the previous year. The year witnessed five deals above $5 billion (with a combined value of $39.8 billion) compared to only one in 2017 when the $11.6 billion Idea-Vodafone merger was announced. M&A activity was led by domestic deals at $57.3 billion, more than double the value from the previous all-time high of $26.7 billion in 2017. The number of announced domestic deals rose 17% from 2017. Total cross-border M&A activity more than doubled to $69.2 billion in 2018 from the previous year, largely due to growth in inbound M&A activity. 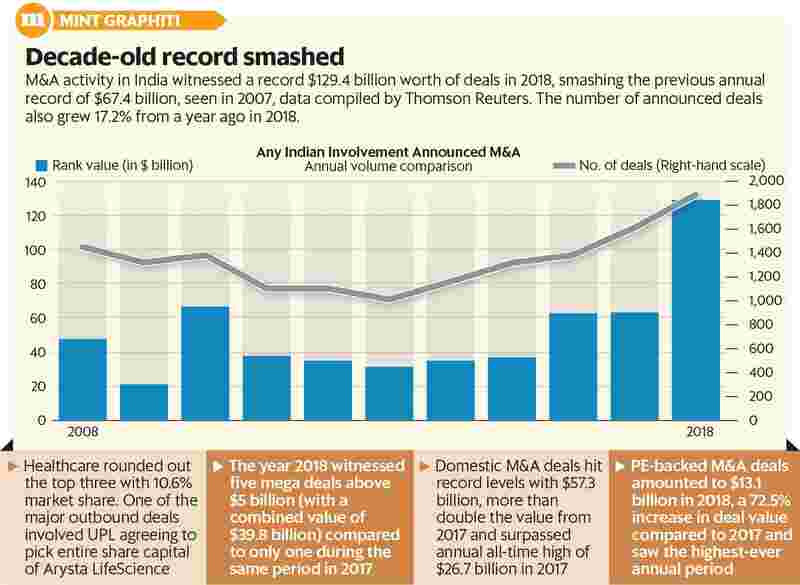 Inbound M&A, or foreign firms acquiring Indian companies, reached $55.8 billion in 2018, to post a 77% increase in deal value from $31.5 billion in 2017. US-based Walmart Inc. acquired Flipkart from SoftBank and Naspers Ltd, for $16 billion last year. The deal contributed to the retail sector capturing 33.1% of India’s inbound M&A activity for a total of $18.5 billion compared to the previous year’s $1.7 billion. Materials and healthcare sector followed with 17.2% and 12.3% market share, respectively. Private equity-backed M&A also witnessed strong activity, growing 72% in 2018. PE-backed M&A deals amounted to $13.1 billion in 2018, a 72.5% increase in deal value compared to 2017. Private equity-backed M&A deals in India’s retail sector accounted for 16.2% of the market share. The deals were worth $2.1 billion, a more than four-fold increase in value from a year ago. Healthcare followed with 13.5% market share worth $1.8 billion, an increase of 163% from 2017. Outbound acquisitions by Indian companies reached an eight-year high in 2018, according to the data. At $13.4 billion in total deal value in 2018, outbound M&A witnessed a more than five-fold increase from the previous year, as the number of outbound deals grew 13% in volume compared to 2017. This is the highest for India outbound M&A since 2010 ($29.1 billion). The country’s outbound acquisitions focused on the materials sector as deal value reached $7.6 billion. Technology took the second place, accounting for 16.2% market share with deals totalling $2.2 billion in value. Healthcare rounded out the top three with 10.6% market share worth $1.4 billion. One of the major outbound deals last year involved UPL Ltd agreeing to acquire the entire share capital of Arysta LifeScience Ltd, from Platform Specialty Products Corp, for an estimated $4.2 billion.